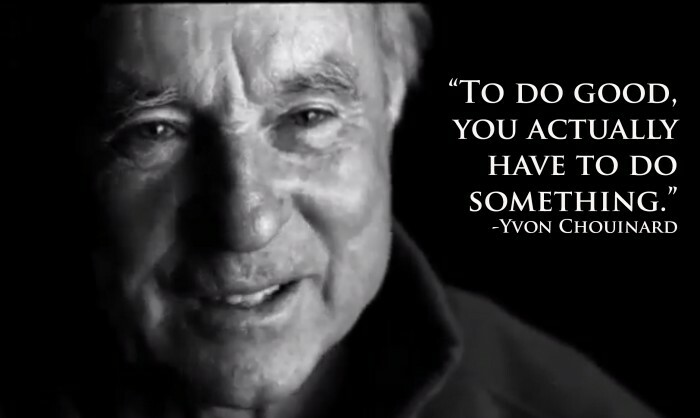 Yvon Chouinard never saw himself as a businessman. In fact, it is he who refers to himself as an “accidental businessman”. Yet, this fortuitous businessman has architected one of the most successful and sustainable businesses ever to exist. Perhaps it was his love for mountain-climbing as a young boy, or the years he spent studying Zen Buddhism (a philosophy which preaches process, rather than result), but Chouinard established Patagonia, Inc. as a paragon of sustainability from the onset. “Build the best product, cause no unnecessary harm, use business to inspire and implement solutions to the environmental crisis”. Piece of cake, right? Well, actually yes, for Patagonia. Patagonia evolved into a clothing company in the late 1970s, when founder Yvon Chouinard – then avid mountain climber and designer of hiking equipment – introduced clothing to the loyal customers of his company, Chouinard Equipment, Inc. As one might suspect, clothing sales far surpassed climbing equipment sales. And in 1973, Patagonia, Inc. was born. At age 76, Yvon Chouinard lives a simple life. He tells the media he has been wearing the same Patagonia jacket for twenty years. In fact, he’s quite plausibly the world’s only owner of Patagonia’s first-ever jacket, from 1973. Simplicity exists as a key component of Patagonia’s success. Chouinard has often been known to quote 20th century French author, Antoine de Saint Exupery. “In anything at all, perfection is finally attained not when there is no longer anything to add, but when there is no longer anything to take away, when the body has been stripped down to its nakedness”. Patagonia’s strategy has remained consistent – to design and market high quality, durable outdoor sportswear and equipment while concomitantly protecting the surrounding environment. Today, Patagonia upholds the same reputation for social and environmental responsibility as it has since its origination. Let’s take a look. The Common Threads Partnership: a collaboration with customers to reduce consumption. Reduce – We make useful gear that lasts a long time. You pledge not to buy what you don’t need. Repair – We help you repair your clothing. You pledge to fix what’s broken. Reuse – We help find a home for Patagonia gear you no longer need. You pledge to sell or pass it on to someone who needs it. Recycle – We will take back your Patagonia gear that is worn out. You pledge to keep it out of landfills. Reimagine – Together, we reimagine a world where we take only what the planet can replace. In 2011, Patagonia became California’s first “benefit corporation”, spearheading the growing movement of corporate commitment to consider environmental and social factors when making business decisions. And, since 1985, Patagonia has donated one percent of its revenue (yes revenue, not profit) to grassroots environmental organizations. But they did not stop here. Instead, recognizing the importance of magnifying impact, the company has, to date, persuaded over 1,400 other corporations to join the “1 percent” initiative. If you’re in need or desire of a new job, you might want to consider a trip to Ventura, California, home to Patagonia headquarters. Flexible time policies enable employees to come and go as they please, allowing many to fulfill their passion for outdoor activities. Such outdoor activities have become a great bond between colleagues. In fact, if surfing or mountain-climbing is not one of your pastimes, you’re likely eating alone in the (massive and fully stocked) cafeteria. And don’t even consider working late hours – the building is locked, everybody out, at 8:00 pm (and weekends). Employees are not only allowed, but encouraged, to take two-month paid sabbaticals to pursue environmental projects and passions. Slacking off? Not in the least. Since 2008, Patagonia has doubled its size and tripled its profits, earning over $600 million in revenue in 2013. Patagonia epitomizes the notion that business is not zero-sum. In fact, profitability and sustainability depend on each other. To date, this is tilted. Generally speaking, corporations must have money to implement effective and broadly impactful sustainable actions. One could contend that sustainability is dependent on profitability. The reverse is simply not true. Yet. One need not be sustainable to be profitable. However, as information transparency increases in the market, as millennials begin to demand “more” from companies, as business leaders shift from profit-fiends to creators of simultaneous profit and impact, and as ESG investing becomes more important to portfolio allocation – you can expect some changes. This, in itself, is certain. The real question is when. Excellent post, Sustainable Investor. Question for you: Do you think, with Patagonia as its leading light, B-Corp’s will become a realistic option for more major, consumer-facing companies? Right now, aside from Patagonia and a couple other well known brands, most of the B-Corps are very small. Thanks greensportsblog, for reading and commenting. You pose a tough question. I think Patagonia will surely pave the way for other companies, given that they are a profitable, well-known, successful B-corp. That being said, I also think that Patagonia was successful well before it incorporated as a B-corp. Moreover, there exists an ensemble of companies such as Google, Apple, etc. that are both doing good and making money, yet are not “B Corps”. This comes back full circle to what I wrote about earlier, why does a company need to call itself a B-corp to do good? I still think B-corps will trade at a discount to intrinsic value. Not because they are any less valuable, just based on my understanding of market perception and investor sentiment. There will be an unyielding perception on behalf of shareholders that a company incorporating as a B corp will not maximize shareholder value. Now, keep in mind Patagonia is a private company. So, that was a really long-winded way of saying, yes Patagonia will likely be a precedent for other mission-driven private companies, but at least in the short-term, I do not think we will see a tremendous advent from the publics. Remember that Patagonia became a B-corp almost four years ago, and the B-corp movement thus far, as you noted, has been slow. Regardless I am excited to keep an eye on this movement! Stay tuned. Patagonia became a B-Corp 30 years after the company started. Hopefully that is not the model forward that it takes 30 years. Don, valid point. If you are saying that Patagonia was successful before becoming a B Corp, yes I agree! However, if you are criticizing Patagonia for waiting so long, keep in mind that benefit corporation legislation only became a viable option in 2010. Prior, no such incorporation existed. I wonder what would happen if Patagonia were to become a publicly traded B-Corp. How would the stock price fare, do you think? A good precedent might be the stock performance of (non) B-Corp but equally managed-for-sustainability Interface Carpet. I’m not an expert on stocks at all (far from it) but I think Interface’s stock performance has been so-so vs. the market (is that true?). Yet, their zero-waste mission remains at the heart of what they do. Also I’d be careful to put Patagonia (and Interface) in the same boat w/ Google and Apple. The latter are both much, much bigger and also have sustainability records that, while improving and impressive in many respects, also have troubling aspects. For example, Google and Apple only recently resigned its membership of the American Legislative Exchange Council (ALEC), a powerful lobbying group that, among other things, promotes climate change denial and the policies that reflect this. I am certainly glad that Google and Apple have left ALEC but am concerned that they sought to be part of this group in the first place.